Figure 1 from Campbell et al. 2015. Schematic representations of sequenced Hodgkinia genomes from (A) Diceroprocta semicincta, (B) Tettigades ulnaria, (C) Tettigades undata, and (D) Magicicada tredecim drawn to scale. Genes involved in methionine biosynthesis are purple; vitamin B12 biosynthesis, red; histidine biosynthesis, green, the 16S and 23S rRNAs and tRNAs are brown, and all other genes light blue. Regions of genomes encoding pseudogenes or nonfunctional DNA are white. 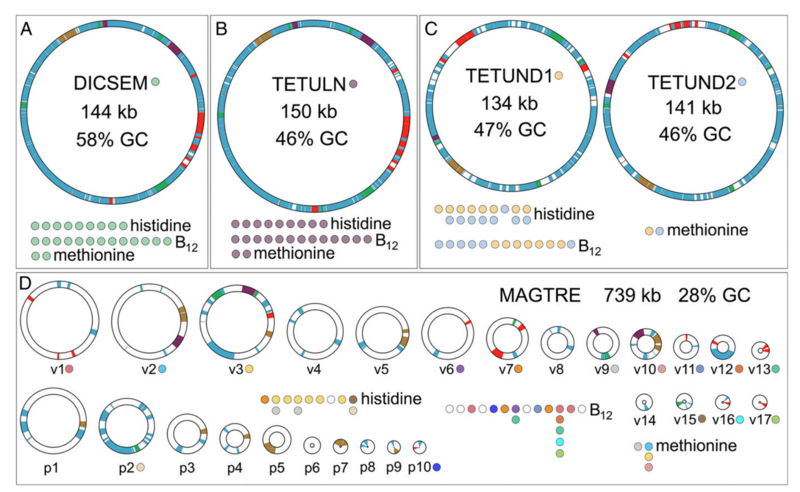 In each box, the gene homologs present on each genome from the methionine, B12, and histidine pathways are shown as colored circles. The Hodgkinia genomes from Diceroprocta semicincta (green dots) and Tettigades ulnaria (purple dots) encode all of these genes on one genome, from T. undata on two (blue and orange dots), and Hodgkinia from Magicicada tredecim encode these genes distributed over many circles (15 dots of different colors). In D, v1–v17 are the verified circles and p1–p10 are the putative circles. All organisms possess beneficial microbial partners (symbionts) that contribute to their health and survival. Many of these live in the gut and are known as the microbiome. Insect symbionts are theorized to bring new features that allow species formation and habitat invasions. In the case of insects that feed on food lacking important nutrients, highly specialized microbes inhabit organs in the abdomen and provide essential amino acids and vitamins. The major goal of this proposal is to study the interactions between insects and microbes and how they function together in a mutually beneficial relationship. The roles of endosymbionts in speciation and biogeography are largely unexplored and their diversity and evolution is poorly known outside a handful of model systems. This research uses cicadas as a study system because they have a particularly deficient diet and are diverse and spread across the globe. DNA data will be used to construct a dated evolutionary tree to study how the cicadas and their symbiont partners have spread around the world and diversified into new species. This information will be useful in general understanding how microorganisms benefit their hosts and specifically in the study of invasions of beneficial and pest insects of agricultural importance. Biodiversity information for cicadas and their symbionts will be disseminated to scientists and the general public by journal publications, society meetings, and the World Wide Web. Citizen science projects and biology lab exercises will be designed and made available. Future scientists will be trained in multiple laboratories, including one postdoc and two graduate students; many undergraduate participants will interact with scientists internationally via the web. Cicada primary endosymbionts have already been demonstrated to include examples of evolution that are surprisingly different from those of other insects, such as rampant symbiont genome duplication/lineage splitting in diverse cicada lineages followed by complementary gene loss and pseudogene formation. To understand the biogeography and evolution of host-symbiont consortia, an existing cicada phylogeny created previously by the research team involved in this work will be expanded and used as a framework. Ecological and symbiont data mapped onto the tree will test hypotheses about the relative timing of changes in cicada habitat association and symbiont consortium membership. This work asks: 1) Does the gain of a secondary (facultative) endosymbiont facilitate the breakdown and or loss of primary (obligate) endosymbiont? Or, 2) Does the breakdown or loss of the obligate endosymbiont allow the invasion of a secondary endosymbiont? Similarly, 3) Do changes in the gut microbiota affect primary endosymbionts (keeping in mind that gut microbiota are known to synthesize essential amino acids for some hosts). Finally, 4) Is symbiont consortium membership related to changes in the external environment (both biotic and abiotic) such as the invasion of new habitats with different environmental conditions and host plants. Improved high-throughput genomic sequencing methods and probes for conserved endosymbiont genes will simultaneously expand the framework Cicadidae evolutionary tree while generating genetic datasets for both of the primary cicada endosymbionts. Surveys of cicada symbiotic partners using metagenomic sequencing (of bacteriomes and fat bodies for endosymbionts) and amplicon sequencing (of gut contents for microbiome studies) will allow the exploration of microbial and fungal symbiont biodiversity. Our hypothesis testing will facilitate exploration of environmental versus evolutionary drivers of biodiversity innovation. New information on the evolution of bacterial endosymbiont genomes will also be produced. A. The Origin of Biological Diversity. 1. The impact of life history evolution on speciation. I chose to study year classes of 13- and 17-year periodical cicadas, because adults appear in different years and thus were believed to be reproductively isolated incipient species. My group discovered that year classes of each species of periodical cicada are for the most part independently evolving units (Simon 1983) with geographic integrity (Simon 1979; Archie, Simon and Wartenburg 1985); however, there are locations were there has been gene flow between year classes associated with life-cycle shortening that can be either temporary (Simon and Lloyd 1982; Lloyd, Simon and Kritsky 1983) or permanent (Martin and Simon 1988, 1990a). We produced evidence to suggest that ecological factors such as competition of juveniles underground and clustering of adults in time and space also had a strong influence on evolution (Simon, Karban, and Lloyd 1981; Simon 1988; Martin and Simon 1990; Heliovaara, Vaisanen and Simon 1994; Williams and Simon 1995). We also demonstrated that likely changes in life history have led to the formation of new species ("allochronic speciation"; Simon et al. 2000) and that genetic change has been facilitated by critical changes in acoustic behavior (courtship signals) (Cooley et al. 2001, 2003; Marshall, Cooley and Simon 2003; Marshall et al. 2003, Cooley et al. 2006). We are currently collaborating with geneticists and theoreticians in Japan to increase our understanding of these life history changes and their relationship to periodical prime-numbered life cycles (Yoshimura et al. 2009, Tanaka et al. 2009). Work with Teiji Sota suggests that not only13-year cicadas but also 17-year cicadas living today have evolved at least twice by life cycle switching on a massive scale. In addition, our periodical cicada work has demonstrated the asymmetrical nature of gene flow between species (Fontaine, Cooley and Simon 2007). We also continue to explore the interaction of climatic and human-caused landscape changes on present day periodical cicada distributions (Cooley et al. 2004, 2009). We are currently collaborating with Spencer Johnston and his student Shawn Hanrahan of Texas A&M University to size the genomes of all periodical cicada species. We have nominated a 13-year cicada for whole genome sequencing as part of the i5K 5,000 insect-genome project and hope soon to compare the complete nuclear genomes of a 13- and 17-year cicada to start unraveling the genetics of life cycle change. 2. The impact of landscape/climate change on speciation. I have focused on island endemic species because insular evolution is simplified and often accelerated compared to continental systems. We can therefore study the complete history of all species throughout their respective ranges and sample many different climatic regimes and ecosystems in a reasonable time frame. I studied island evolution in Hawaiian insects (Carson et al. 1982, Simon et al. 1984, Simon 1987) and continued this work at UConn with my PhD student Steve Jordan (Jordan et al. 2003, 2005, 2007). I began parallel work in New Zealand after learning of a large radiation of NZ cicadas occupying nearly every available climatic/vegetational zone. New Zealand's well-studied and dramatic landscape and climate changes make this system ideal for exploring the impact of physical changes on speciation. We have now studied the molecular evolution, courtship songs, and ecology of every one of the 60 taxa of NZ cicadas throughout each of their geographic ranges (Arensburger et al. 2004a; Buckley et al. 2001a, b, c, 2006; Buckley and Simon 2007; Marshall et al. 2008, 2009, in press., Simon et al. 2009; Hill et al. 2009). We traced the origin of NZ genera to Australia (Buckley et al. 2002; Arensburger et al. 2004b), and discovered that all of the diversity we see today in NZ arose in the last 10-15 Ma. Two pulses of diversification occurred in association with mountain building followed by more-or-less steady diversification throughout the ice ages (ca. 2 Myr). Based on courtship song, combined with DNA and morphological evidence, we estimate time to speciation at ca. one to two million years. B. The Spread of Biological Diversity. Biogeography. We began our biogeographic studies with the largest tribe of cicadas, Cicadettini (>1000 species worldwide). Using molecular phylogenetics, we found that this tribe originated and diversified in Australia and later spread to the rest of the world. PhD student Chris Owen discovered that diversity in the largest Australian genus is much greater than previously understood (he has created five new genera and is describing 35 new species). In Australia, we are interested in the effect of increasing aridification on diversification over the last 30 Myr. Results from this grant formed the basis for a recent NSF award to study the biogeography of all cicada tribes worldwide (more than 3000 species). Technician Kathy Hill, PhD Student Geert Goemans, and postdocs David Marshall and Ben Price are the primary researchers working with me on this project. Geert Goemans, is focusing on South and Central American cicadas. Ben Price, will focus on African lineages. John Cooley is focusing on the genera Okanagana and Tibicina in North America and Europe. We have collaborators in more than a dozen countries worldwide. Our biogeographic studies will be based on a molecular phylogeny constructed from mitochondrial and nuclear DNA data and will incorporate information on continental movements and climate change. A new graduate student, Russ Meister, will study co-speciation and biogeography of the bacterial symbionts of the family Cicadidae worldwide in collaboration with Nancy Moran and John McCutcheon. C. The Maintenance of Biological Diversity. Species are not guaranteed eternal existence. Like climate or habitat change, hybridization can lead to extinction. As well as climate or habitat change hybridization also can lead to extinction. Our research is demonstrating that animal species exhibit far more hybridization than previously realized. We have an NSF proposal under development to study interactions at hybrid zones between more than 20 NZ cicada species pairs with divergence times ranging from 20,000 to 7 million years. We predict that while the ability to hybridize decreases with increasing genetic distance, success is highly dependent on behavioral differences. PhD student, Beth Wade, and proposed postdoctoral researcher, Lindsay Popple, will study the contact zones. Our phylogeographic studies to date (Marshall et al. 2008, 2009, 2011) provide critical background data to estimate relationships and divergence times. We will estimate gene flow across contact zones and study the extent of introgression over geography. Some of the species complexes may turn out instead to be "hybrid swarms". Much of the suspected introgression may be associated with habitat modification by humans. A parallel project is underway to study the phylogeography and evolution of the NZ genus Maoricicada (Buckley et al. 2001, Hill et al. 2009, Hill et al. in prep). An understanding of human-aided spread in the past can help to design future strategies to preserve species diversity. D. The Documentation of Biological Diversity. As part of a NSF effort to address the critical need for taxonomic expertise to identify our disappearing biological diversity, we are participating in an NSF PEET project (Partnerships to Enhance Expertise in Taxonomy). Along with colleagues from the NY State Museum and the Illinois Natural History Survey, we have been training new experts in the taxonomy of our group, Auchenorrhynchan Hemiptera (ca. 50,000 described, and ca. 250,000 undescribed). This work will be followed by an NSF submission in June to focus on Auchenorrhyncha in the Philippines, a relatively unexplored hot spot of insect biodiversity. Ph.D. students Geert Goemans and Chris Owen, and postdoctoral researcher, Young June Lee, are the primary researchers focusing on taxonomy. Kathy Hill and David Marshall are focusing on deeper level taxonomy of the family in addition to their studies of biogeography and phylogeography mentioned above. They also study the taxonomy of NZ cicadas and various Australian and North American genera (especially Gudanga and Tibicen). John Cooley is studying the systematics of the genus Okanagana and relatives. The first DNA I sequenced was a section of the mitochondrial small subunit ribosomal RNA gene (12S rRNA). Studying this and related segments, deciphering their secondary structure and comparing their evolution to that of the homologous segment in other species (Simon et al. 1990, 1994, 1996; Hickson et al. 1996, Hickson et al. 2000, Buckley et al. 2000, Saux et al. 2003, Carapelli et al. 2004) led to a great appreciation for the strong variation in rate and pattern of DNA evolution among nucleotide sites and across lineages, and how this rate variation influences phylogenetic tree construction. We showed that incorporating information on secondary structure is critical for alignment of rRNA, that variation in rate and pattern of DNA evolution is strong and that ignoring this variation has more of an impact on phylogenetic analysis and molecular-clock dating than any other factor (Simon et al. 1994, 1996; Frati et al. 1997; Sullivan et al. 1995, 1996; Gogarten et al. 1996; Buckley et al. 2001, 2002; Marshall et al. 2006; Simon et al. 2006). Our work also addressed problems of experimental design/sampling (Simon and Archie 1985, Archie et al. 1989), molecular methodology (Simon et al. 1993, Simon et al. 1994, Phillips and Simon 1995, Simon et al. 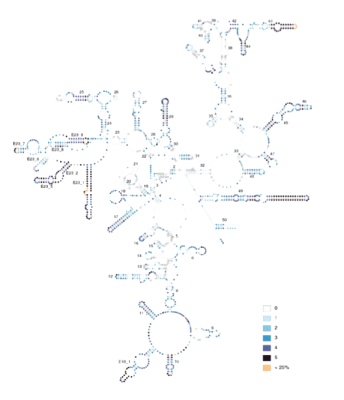 2006), phylogenetic methodology (Buckley et al. 2001, Buckley et al. 2002, Buckley et al. 2006), and data partitioning (Marshall et al. 2006). You can read more about some former research projects here.